Bankruptcy is all about getting a fresh start. Below are some different ideas for your financial life after bankruptcy, to help you rebound from Bankruptcy and fully take advantage of your fresh financial start. None of these suggestions are magic bullets that are instantly going to give you an 850 credit score. However, if you put into practice some of these practical ideas they will help you rebuild your credit over time. .
Join a credit union. Credit unions are a likely source for car loans after bankruptcy. Their mission is helping members financially. They are typically more willing to lend than a traditional bank, that is why in the typical bankruptcy I file the debtor has at least one loan or credit card issued by a local credit union. Put the money you have been spending to make your credit card minimum payments into a savings account for yourself. Also come up with other ideas to save money like cutting back on trips to the store or bringing your lunch to work instead of eating out. Use these savings for your future retirement or unexpected emergency expenses. You will be surprised at how fast your savings adds up. Have contributions to a savings account or retirement plan automatically withdrawn from your paycheck. By having it taken out of your paycheck it is like it is not even there and you are not tempted to spend it. If it is not going into a 401k or similar retirement vehicle consider requiring having two signature on your savings account to make a withdrawal so you are less tempted to spend the money and more likely to save. Check your credit report to make sure the discharged debts are noted as discharged. Do not be tempted to use a credit repair business to help you, you can do this yourself and not be ripped off by some scam artist. 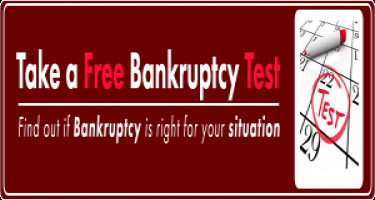 No matter how much someone may promise or how tempting the offers seem, no one can remove a bankruptcy off your record, it just can not be done. Get a single credit card, use it sparingly and pay it off every month. DO NOT run a balance. Pay on time and pay the full balance off each month. To start off again try to get store and gas company credit cards or even a secured credit card. Pay every bill you still have, e.g. utility, rent on time. Stay away from payday loans, they are at high interest rates and are a "bad credit" trap. Try to minimize the number of inquiries on your credit report, once you have established few good credit lines. The more inquiries on your credit the lower your credit score so do not go crazy applying for all sorts of credit to try and reestablish your credit because you will hurt yourself more than you are helping. The stronger and cleaner your present financial condition is, the better candidate you are for future credit. Work to focus attention of lenders on how you have handled money since the bankruptcy. Hopefully, if you following these tips over time you will be able to rebuild your credit and take full advantage of your financial fresh start.